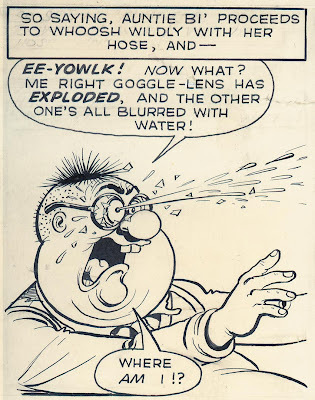 A strange popular sub-genre of British humour comics in the sixties were strips concerning microscopic inhabitants of the human body. The Numskulls started the mini-trend in The Beezer in the early sixties. A very simply drawn strip, it featured the inhabitants in various "departments" of a man's head (brain, eyes, nose, mouth, ears) steering or suggesting actions for him to take, dealing with his problems etc. When Odhams launched their rival comic Wham! in 1964, the Numskulls influence was obvious in the strip George's Germs. Odhams taking the concept a stage further than DC Thomson the microscopic "germs" inside Georgie's body often found themselves in pitched battle against invading ointment-microbes and the like. When Wham's companion comic Smash! came along in 1966 the popularity of Georgie's Germs inspired a similar strip; The Nervs. Usually drawn by the brilliant but often overlooked Graham Allen, The Nervs immediately became one of the funniest strips in the new comic. Whilst The Numskulls inhabited the bland and nameless "man" and George's Germs inhabited the sympathetic George, The Nervs ran amok inside the obese body of the dim-witted "Fatty". A much crueler strip by far than its predecessors, putting Fatty through all sorts of ailments and slapstick situations, but definitely the funniest of the three. By late 1968, with Smash! 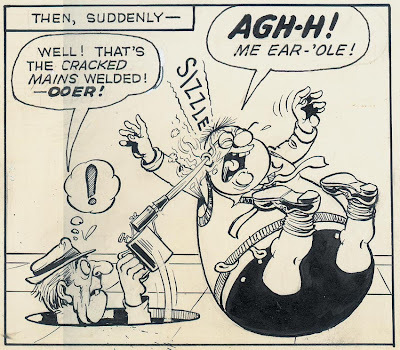 the sole remaining Odhams "funny", Ken Reid's strips Frankie Stein (Wham!) and Dare-A-Day-Davy (Pow!) had ended. Perhaps not wishing to lose Ken to Fleetway (where Leo Baxendale was by then finding work) he was given the artistic duties on The Nervs. This was the perfect vehicle for Ken Reid's gruesome "comic horror" and he completely revitalized the strip, turning the Nervs into blue collar workers and Fatty into more of an idiotic buffoon. 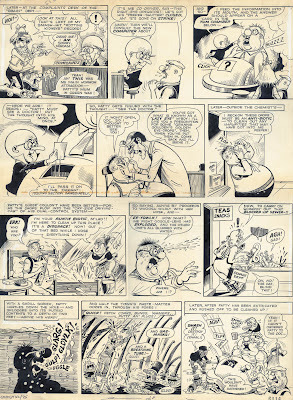 The strip shown above shows Ken Reid's original artwork for his final Nervs story,(given to me years ago by an IPC group editor) which appeared in the final issue of the first series of Smash! before the IPC revamp of the following week. 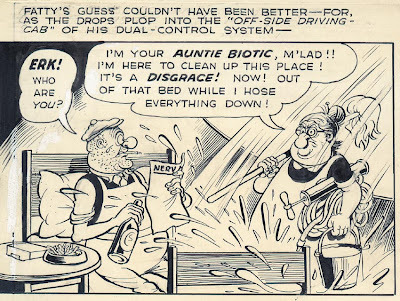 The incoming IPC management hated the vulgarity of The Nervs and allegedly an internal memo was circulated within the company instructing that the strip be canceled and never reprinted in their new wave of comics (Whizzer & Chips, Cor!! etc). So the pages above show not only the end of The Nervs (and without a doubt the most gruesome end for a children's comics character with Fatty swallowing raw sewage) they also mark the end of the short but memorable run of Odhams' "Power Comics". 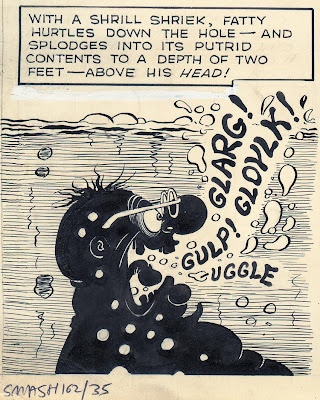 I've blown up some of the panels so you can see the detail of Ken Reid's work. You'll notice that he penciled in the lettering himself for letterer David Gould to follow over. You'll also see some of the "white out" where mistakes have been corrected. Ken Reid usually signed his Odhams strips. Interestingly, this final work isn't signed. It's unlikely he'd have forgotten. Perhaps by then IPC's new policy of returning artists to anonymity was in force. Or perhaps Ken was too saddened by the end of this great era in his career to sign it. Either way, the work still stands up as a great example of Smash! at its best, and Ken Reid at his funniest. Boy what a sick cartoon......Ken sure liked crossing the line.. Sadly, publishers are too worried about having their comics pulled by retailers to use comic horror themes now, particularly as UK comics are by and large increasingly aimed at an ever younger target audience. 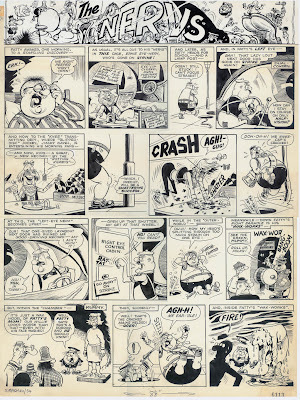 My earliest comics memory is of reading "Pow" and being hooked on Ken Reid's "Dare-a-Day Davy".How wonderful (courtesy of the Internet) to explore his work again and realize what innate good taste I had as a seven year old- the man's a titan! Thanks so much for sharing this wonderful example of his talent. The technical ability is stunning and reinforces the black humour brilliantly. I wonder if his family know what pleasure he gave-and is still giving? New to this blog game Lew. Wondering if my last email managed to reach you that's all. I don't think it did, Paul. When did you send it? I never warmed to The Numskulls when I was a kid I'm afraid. 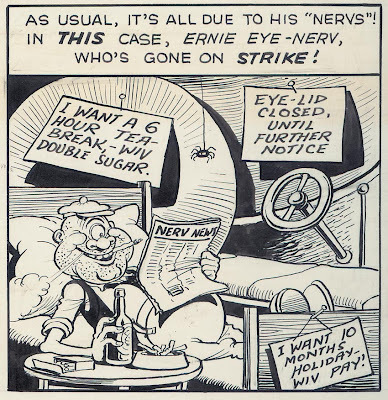 The Nervs were where it was at for me, both in Ken Reid's version and Graham Allen's previous long run on the strip. He did rub out pencil lines. He went through boxes of rubbers! Good to hear from you, Antony. Thanks for correcting me on that. Clearly I was misinformed and I shouldn't have relied on my source. My apologies. I'll delete that bit right away. 40 year Flashback: It's Terrific!